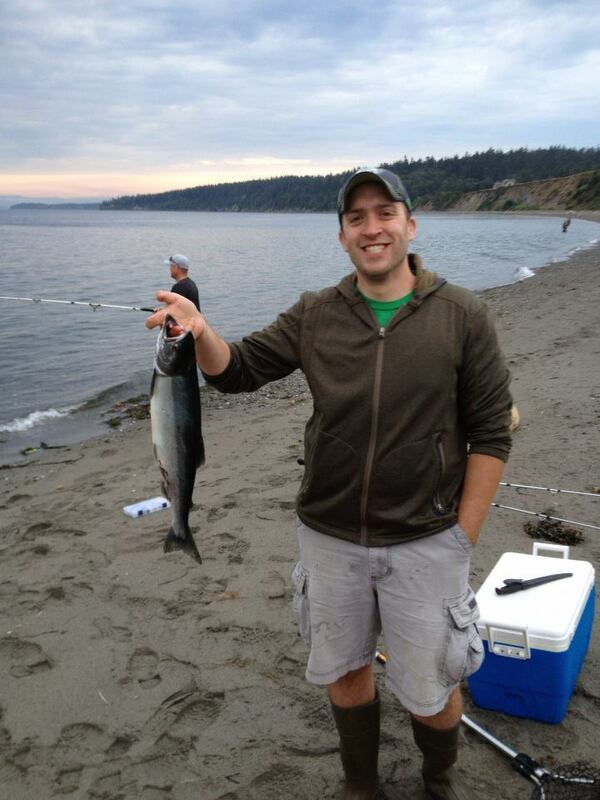 I didn’t like fish very much until I moved from Massachusetts to the Seattle area. I don’t mean shellfish. Maine lobster and New England scallops will always hold a special place in my heart. I mean fish. Slimy, swim in the sea, big eyes, fins, fun to catch with a rod and a cooler full of beer, fish. See: Fish. Cooler. Fun! Note: This is not the fish discussed in the rest of the post. Unfortunately, that’s the mentality that I carted across the country with me in my Toyota. For the first year of my residence, i avoided eating fish, unless it was being served to me directly, and so – for a full year – I lived in a state of ignorance of the wonderful and utterly delicious bounty that the Pacific Ocean provides. Yes, I toured Pike Place market. I saw the shelves of fish waiting to be tossed headlong at eager tourists. I watched – enjoying my burger, or some such land-based meal – as friends ordered and seemed to enjoy plates of salmon, rockfish and halibut. So in May of that first year, I was utterly shocked by what seemed to be a pervasive and rabid fervor concerning the release of Copper River Salmon. It was everywhere. It was advertised online and in the newspaper. Banners were hung on the front of restaurants and grocery stores. Articles appeared about the best ways to cook it, and about recipe competitions between local chefs. To a self-proclaimed fish hater, it was weird. I wondered: Why would an entire region of people care this much about fish? Is it just a marketing scheme? Why is it this big of a deal? Who cares? It’s just FISH. And then I tried some. It’s not just fish. Copper River Salmon is amazing. It’s the closest you’ll get to the perfect fillet of anything that swims through the ocean. 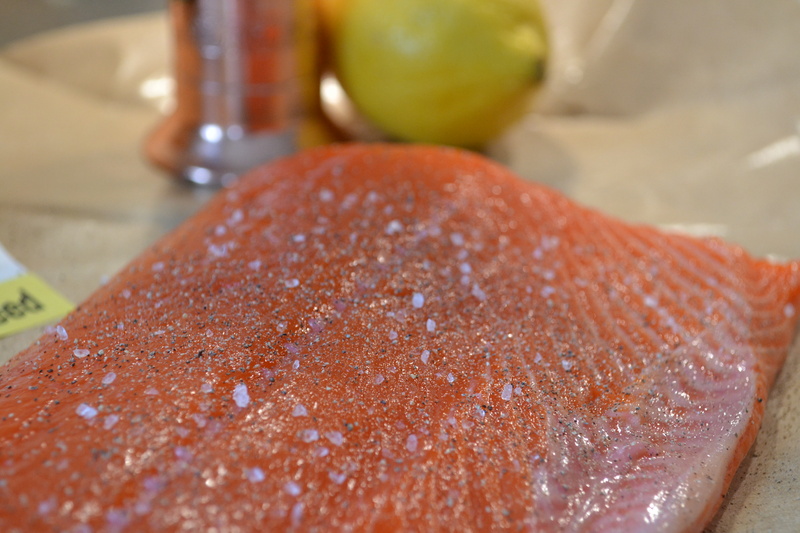 The flesh of a good slice of CR Sockeye is packed with oil and fat, including the heart-healthy Omega-3 oils. 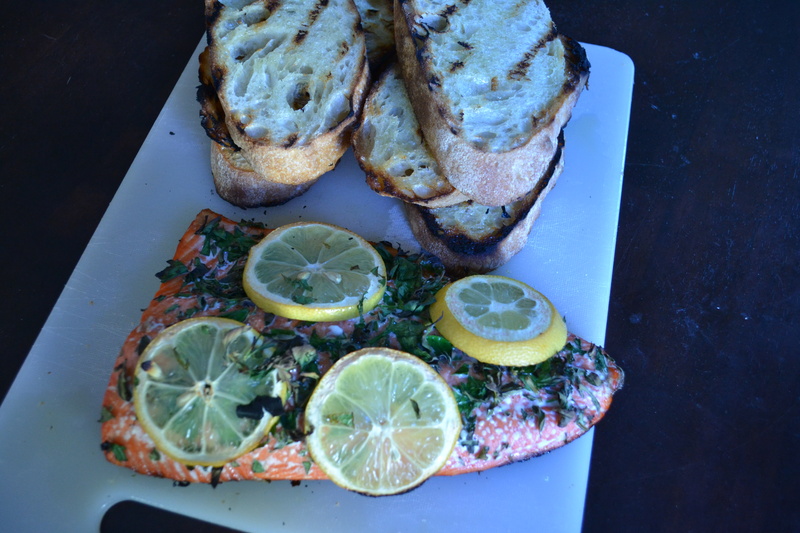 The reason it’s so wonderfully flavorful, is that these are the hardest-working salmon in the Pacific. The Copper River is a 300 mile long nutrient-rich Alaskan waterway that runs fast and strong, so the fish have to work hard and travel far to reach their spawning grounds. That means that they have to build up those stores of fats and and oils to make that long journey, and it’s those same fats and oils that make them taste SO GOOD. It’s no cod. The flesh is a dark red-orange color, and tastes rich and nutty. Fast forward seven year, and I’m one of those crazies, waiting in line at the fishmarket for a perfect cut of this delectable denizen of the deep, which I prefer grilled with some spice and a little citrus to set it off. 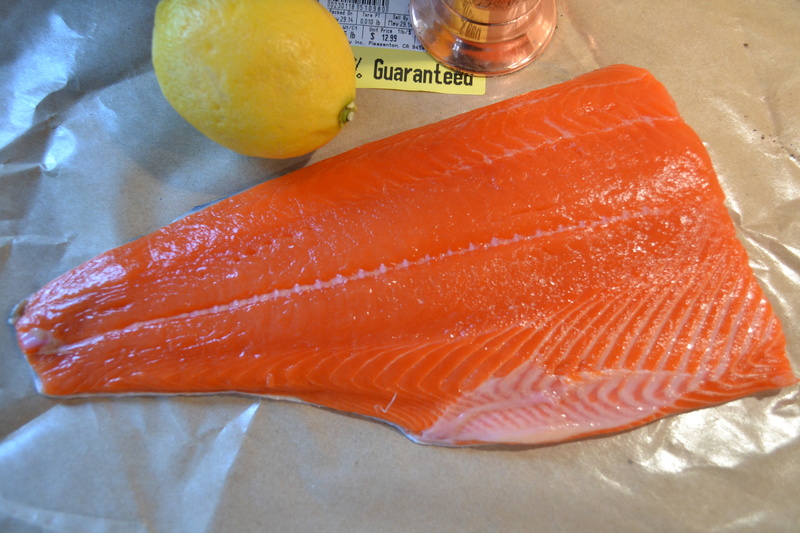 There are countless recipes out there for Copper River Salmon, and Sockeye Salmon in general, but over the years I’ve found that this fish is so rich and flavorful that the less you do to it, the better the final result will be. For this recipe, all you need is a salmon fillet, a handful of fresh herbs, a nice, juicy lemon, and a little salt and pepper. Remove the fish from the packaging, and check for bones. I use a small pair of pliers to remove any stray pieces. Pat the fillet dry with a paper towel, and season sparingly with salt and fresh-ground pepper. You can apply the herbs one of two ways, whole or chopped, both of which I have tried, with great success. 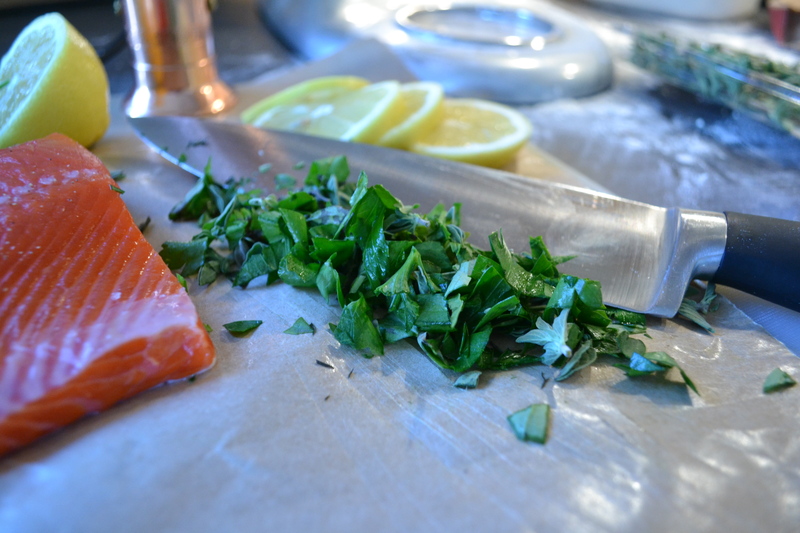 Leaving the herbs whole allows you to impart hints of the flavor, and then remove them from the fish. Chopping the herbs makes removing them after grilling more difficult, so it encourages you to leave them on the flesh, which gives the final product more herbaceous flavor. 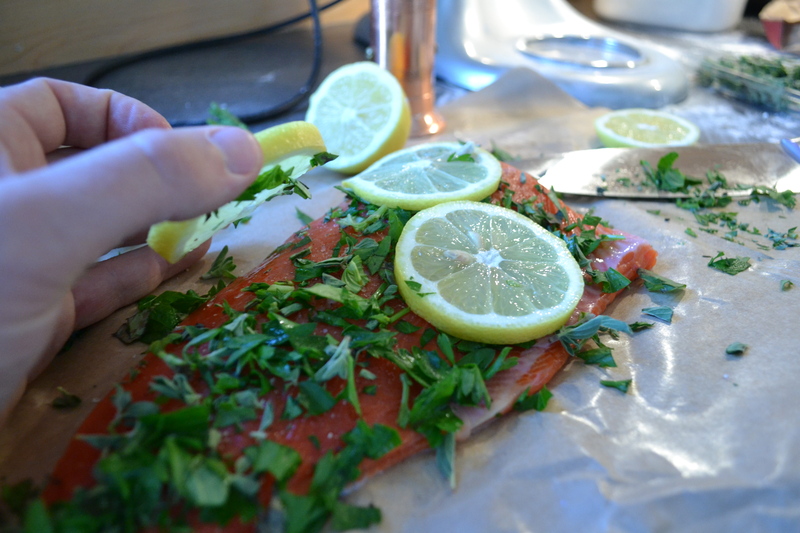 Whichever you choose, lay the herbs on the seasoned fillet, and then place slices of lemon on top. Preheat the grill over medium-high heat, and prepare the grates for grilling by cleaning and spraying them with non-stick grill spray. Place the fillet skin-side down directly onto the grate, and cook with the grill closed for 8 minutes. 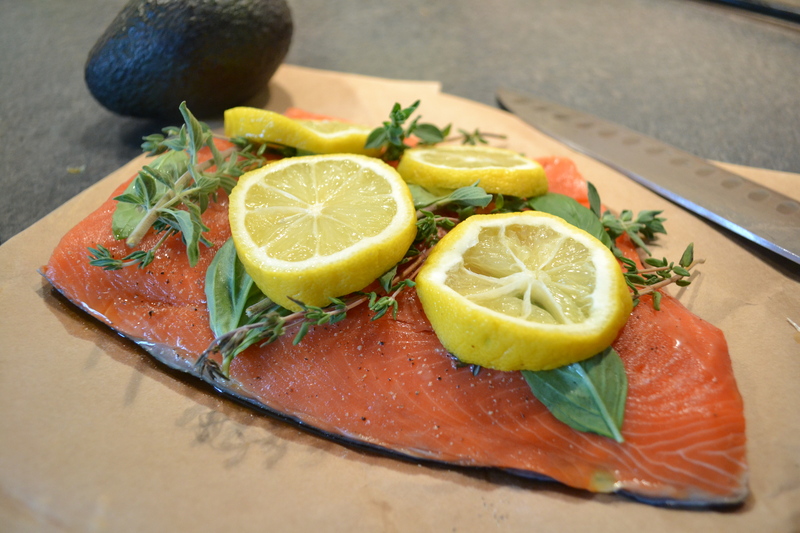 Salmon is easy to overcook, but if you keep an eye on the cross-section of the fish, you’ll be able to watch the cooking process. The fatty oils in the skin side will keep it moist, and the lemon slices serve to lock in a lot of flavor and moisture. 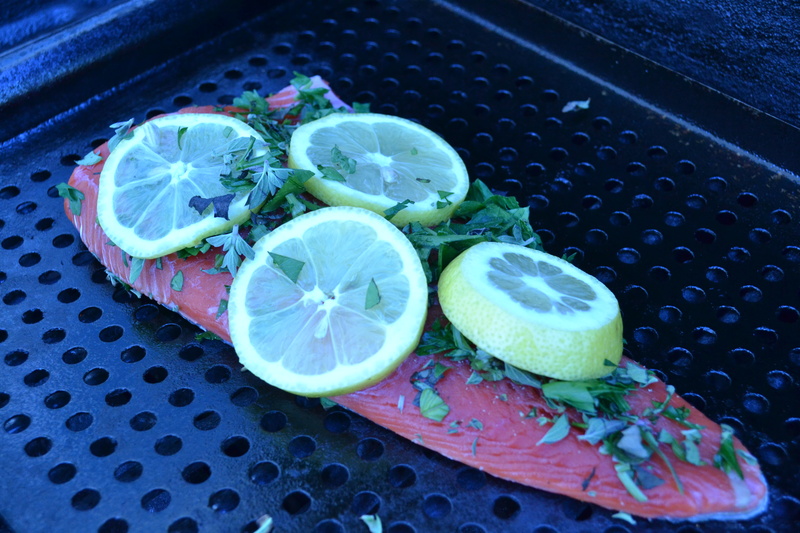 Remove the fish from the grill, and allow it to rest for a few minutes as you prepare sides or other ingredients. 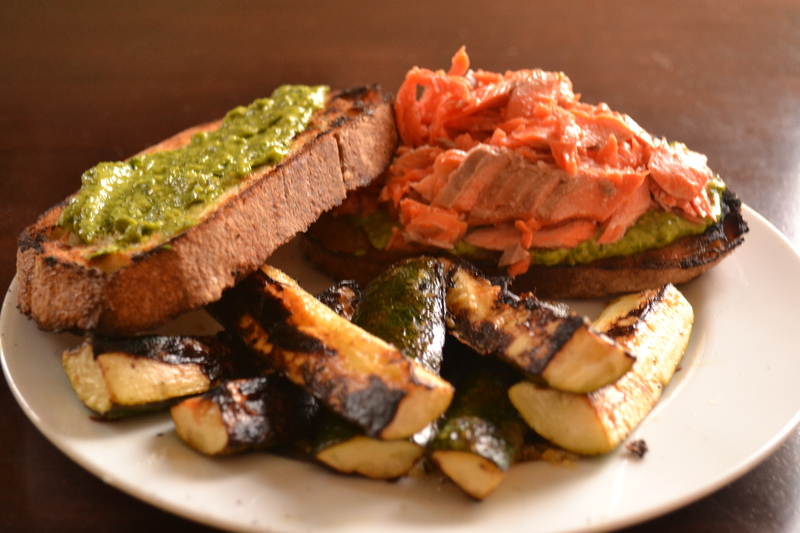 Recently, I’ve been serving this salmon as the protein for a simple sandwich with grilled bread, my avocado pesto and a little arugula. I don’t get out fishing nearly as much as I should, but there’s plenty of crabbing to be done here in the Seattle area. It’s the highlight of the summer! I miss fishing sooo much! Where I am in Germany there aren’t too many big lakes and most places are catch and release. I used to live in the Chesapeake Bay so we had crabbing and fishing. Good times! The salmon return this year is supposed to be amazing here. I can’t wait to get out there this summer! It’s so good. 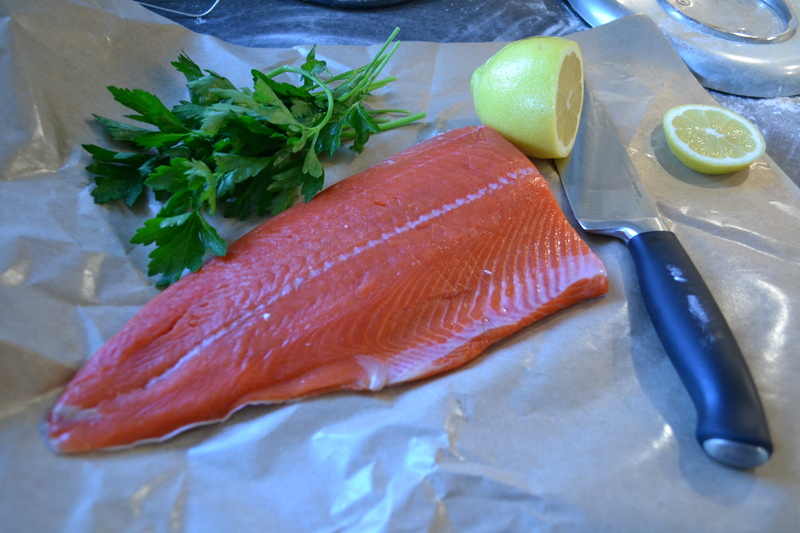 We’re spoiled with sockeye most of the year, but the copper river fish are always so good. It’s the best time of year!